Would think by weight. Believe the originals were a casting of aluminum, with hollow chamber inside. 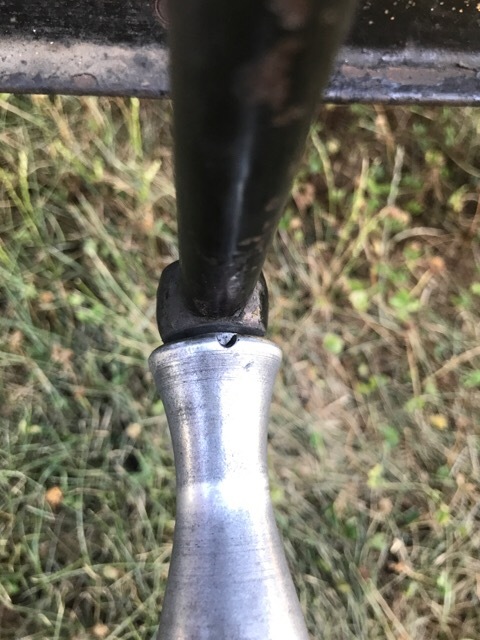 Counter bores at each end for the axle pin. Modern replica would be turned from solid alum stock. Dan ... so .. not knowing much about aluminum ... I'm assuming the older, cast aluminum would be heavier? I think Dan is saying the cast piece with voids would be lighter than one turned from a solid billet. ?!? How do you tell if they're installed ? If they are in place they'd be difficult to weigh accurately. Some of the originals have a half round notch on the back side. Another way to tell, unless the handle is NOS, is there will have been a significant amount of wear on the bore. As Larry posted, the original would look worn, the 10 rings probably worn too, and nicks and or other damage. 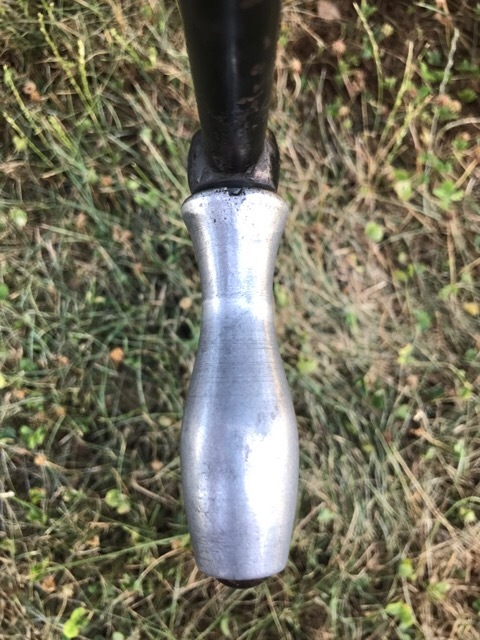 The interior of the handle is hollow, as you can see by the dotted lines on the print. T-520....BTW, the print calls out aluminum handle to be Black Enamel finish. Here is a close up of the notch that Larry is talking about on the crank handle on my late '13. Dan, is the drawing you post that of an aluminium handle? the black rubber/phenolic handles had the ribs but I do not recall the alloy ones being the same. 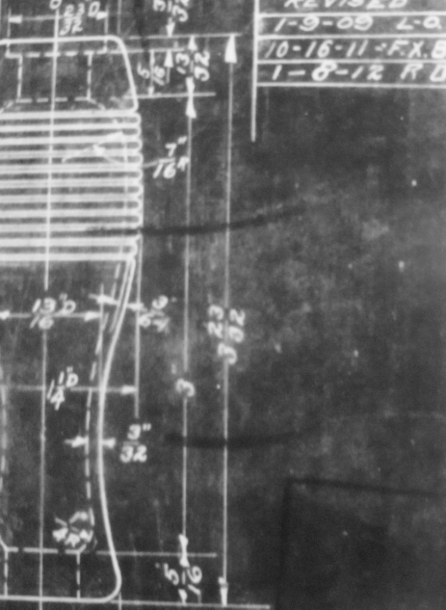 Interesting example of the blueprint specs not necessarily being what was produced. Notes show the drawing was last revised January 8, 1912. Dan, the question is for an aluminum handle. I have an original '13 engine I bought several years ago, and it still has the original starting crank and handle. The crank has never been removed, and the ratchet is still riveted to the starting crank. There is no notch. I have a mint starting crank on my '13 roadster that I bought several years ago at Hershey with only .001" wear. I paid $20 for it. I lucked out on that one! Larry, does it have the ribs like the drawing shows ? 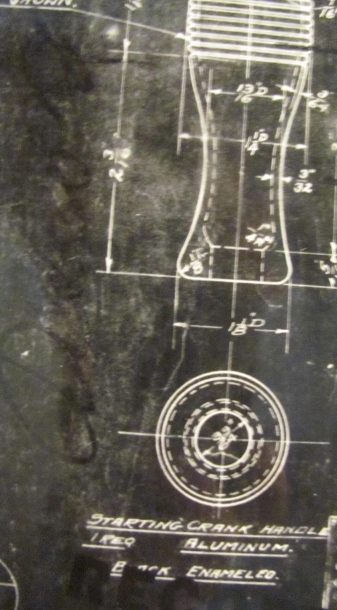 Yes, the print rev Jan 8, 1912 gives material as aluminum, its a casting too, as you can see the hollow design, wall thickness 3/32", has 10 'rings' turned on the outer. The later handles in aluminum are smooth as Larry showed, but I don't know the spec, if cast or if Ford turned the handle from bar stock. Normally Ford cast the alum, to save expense of material, but have to defer to others if the later smooth handles are solid aluminum originally. 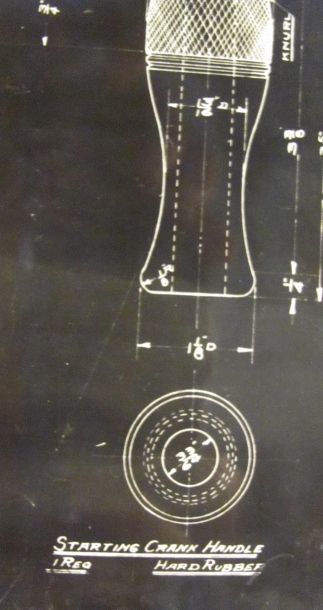 Only have these two drawings of the T-520, the Jan 8,1912 rev, which is painted alum with rings, and the Jan 9, 1909 rev, but its of hard rubber and has cross knurling and ring borders. Thanks Dan. I wonder if Rich is correct, the blueprint not reflecting reality? Has anyone fossil evidence of ribbed alloy handles?